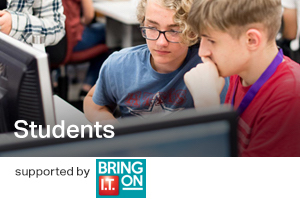 Northern Regional College is currently running its Digital Skills week with support from Microsoft Ireland, impressing on students the importance of digital skills. It's Digital Skills Week at Northern Regional College this week, and the school has partnered with Microsoft Ireland to deliver a series of talks to its students on a range of digital skills for employability. Students also heard from speakers from Ulster Bank, the Police Service of Northern Ireland, Zymplify, and Ulster University on the importance of digital skills in their industries and job roles. The series of events coincides with the Europe-wide ALL DIGITAL Week programme and is running on all six of Northern Regional College's campuses. It aims to engage students in events with the aim of tackling digital transformation and its effects on industry. NRC itself is even in the midst of its own digital transformation, with plans to allow students to access course materials and even submit assessments anywhere through a mobile app. Microsoft Ireland's Academic Program Manager Stephen Howell spoke at one event: "At Microsoft Ireland, our ambition is to help every student, through the power of technology, to realise their potential. We do this in a number of ways including working together with Northern Regional College to showcase the limitless possibilities that a career in the technology sector can afford. With the sector needing over 70,000 new workers over the next five years alone, there is a strong need to promote STEM education and provide new and innovative ways for our young people to grow their interest in technology."